Our proprietary epoxy and exclusive stone formulations are of the highest quality in the industry and will provide not just a beautiful new garage floor, but also one that's safe, durable, and easy to clean. And we'll always put that in writing with our unconditional warranty that's backed by Russell's Promise. Read more details about our garage flooring further down this page, learn about our pricing here, or click/tap the button below to schedule your free in-home cost estimate today. 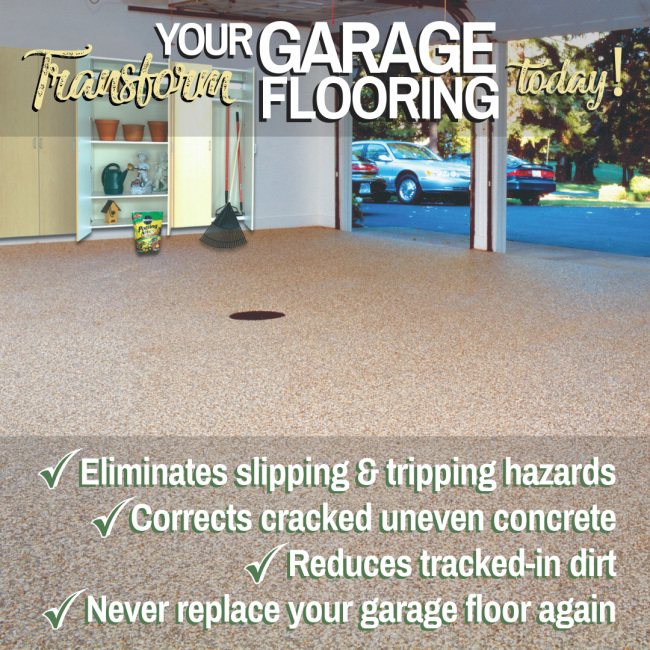 Cracked, uneven, or broken concrete in your garage doesn't just look bad. It can be dangerous, not to mention slippery. Our proprietary Hydrostatic Port Technology™ keeps your Nature Stone floor clean and dry by allowing water to flow through to the drain and/or evaporate back up. 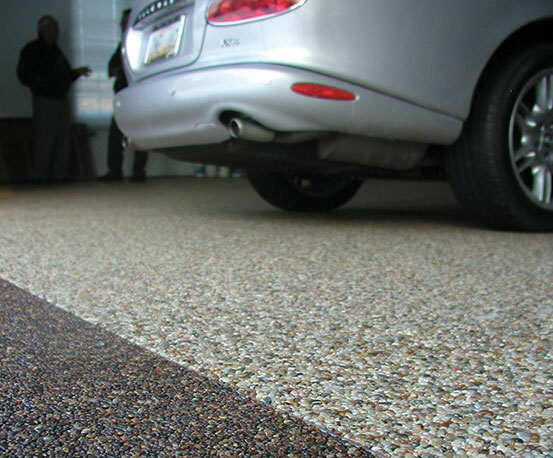 We offer a wide variety of high quality, proprietary stone colors and styles for your new garage floor, setting us apart from the competition and do-it-yourself options. And with no messy tear-out and a one-day installation process done by our highly trained professionals, your new floor's beauty and durability will last a long, long time. Authentic NATURE STONE® Brand Flooring is easy to clean! Use a vacuum for everyday cleaning of loose dust and debris. For heavy duty cleaning of spills and stuck-on grime, use one of our specially-formulated cleaning products in combination with a steam vacuum or shop vac. SCHEDULE YOUR IN-HOME DESIGN CONSULTATION TODAY TO SAVE $100!